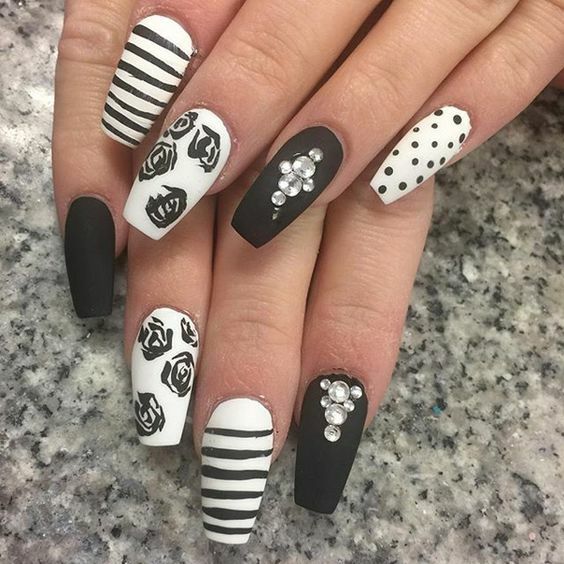 Black And White Nail Designs - Cherry Colors - Cosmetics Heaven! Each fashion season has its key trends, a fashionable color spectrum, and highlighted accessories, but there are things, which never go out of style. One of these things is a monochrome manicure, which goes well with almost all outfits and is suitable for any occasion. Besides, black and white colors create a certain mood and imply universal meanings. 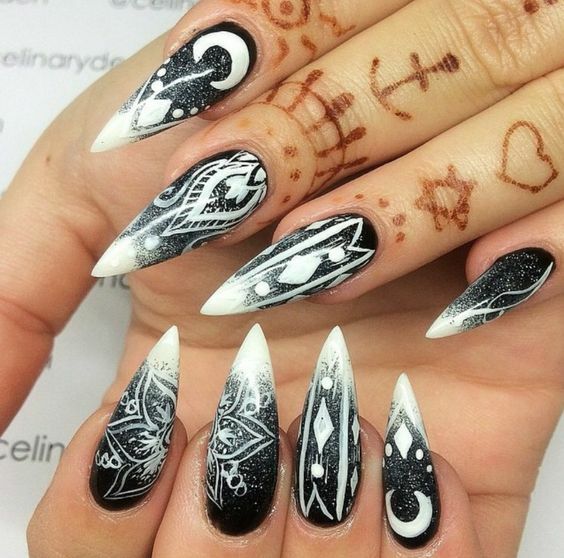 Here are some facts about the most sought-after black and white designs, styling tips and a collection of incredible black and white nails designs. This classic variant looks dope on all nail shapes. However, not all designs may be performed in a black and white palette. 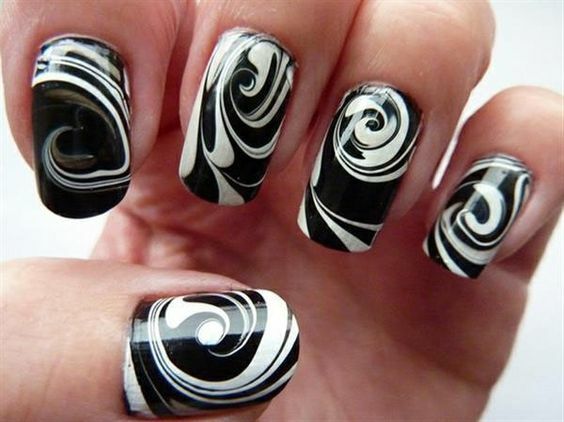 There are those monochrome patterns, which adorn the nails and always look great. They offer a variety of details, and designs may be plain or complicated. You may go for simple dots and basic drawing or create a holistic picture on two nails and leave others covered with a basic hue and a top coat. Contrasting colors look great in floral designs. You can pick any flower and add amusing details for a greater effect and playfulness, or leave the design plain and elegant. This pattern gives a bunch of opportunities for the combination. Flowers, vines, butterflies, dots, and lines should be considered. 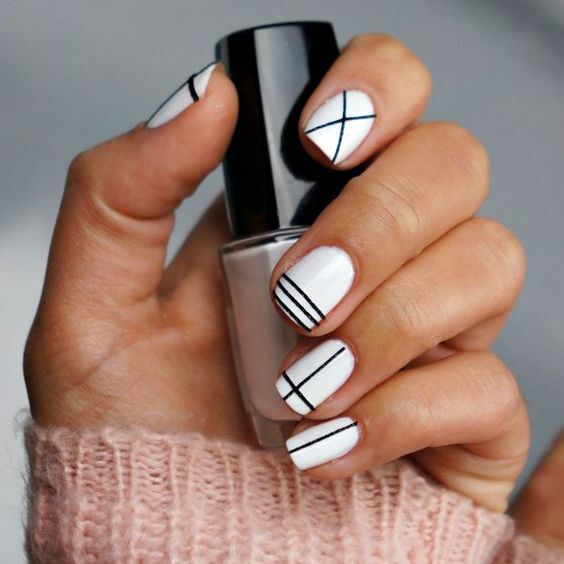 Straight and curvy lines and geometric shapes such as triangles, rhombuses, and ovals may be perfectly combined in a B&W manicure. Besides, there may be a fusion of lines and shapes, which looks surreal, yet appealing. Animal print is timeless and it looks especially beautiful in a black and white palette. You may choose a zebra pattern with black studs as accents. They are easy to create because you are free to paint whatever you want. This design is a little bit messy, but it looks attractive. Don’t overdo for not to create a sloppy effect. This variant is not only for musicians but also for music lovers and creative personalities! 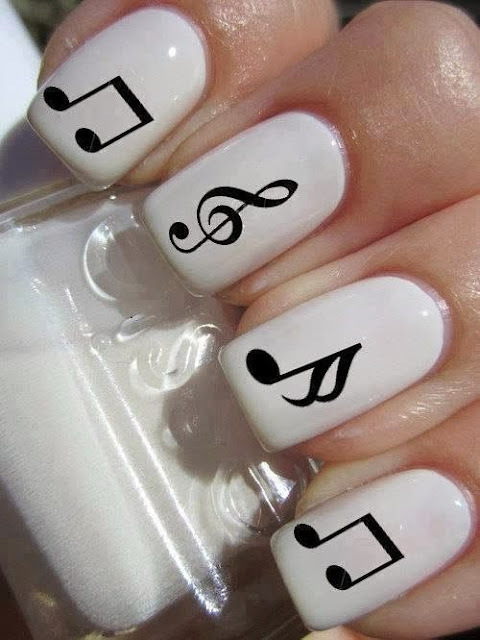 You may get music notes of different shapes and put them either on each finger or on separate fingers such as a ring finger or a thumb. If you want to get a festive manicure, add some glitter. This pattern is always trendy as it is classic. It is easy to do and you may add a colorful accent such as a red bow. It will add a zest to the manicure. A matte trend is loved by many fashionistas. You can have nails painted in black or white and add a delicate inscription on certain nails. Choose between words: love, life, fun, laugh. It will be very cute. This one is a traditional design for a black and white color palette. It looks sophisticated and is achieved by using wraps. You may add colorful accents for a more flawless look. 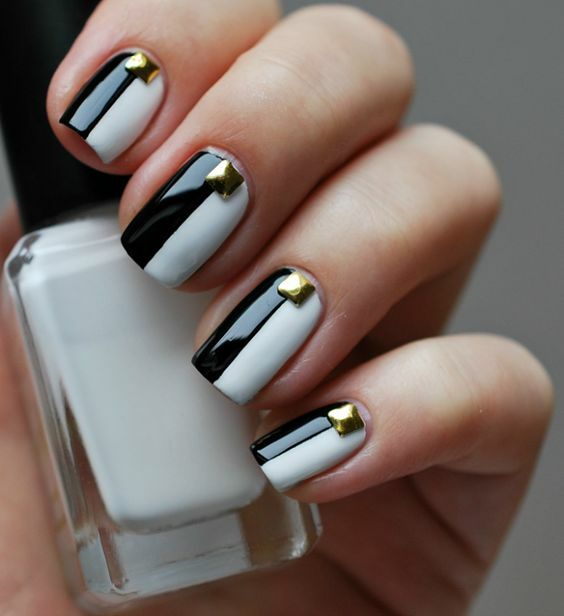 If you think and a black and white manicure is too plain for you and you want to stand out, then add golden accessories. This shade perfectly matches a monochrome design and adds a splash of color, which makes the manicure even more appealing. Vertical stripes elongate the nails visually, so this pattern is ideal for a wide nail bed. In the meantime, horizontal stripes can make your narrow nail bed wider. Besides, this manicure works well with casual and formal outfits. If you stick to the hottest trend in 2017 – matte and monochrome nails, but still want to add a hint of glam, consider rhinestones. They will add shine and make you more feminine. If you want your manicure to have a long lifespan and look attractive despite the circumstances, follow these tips. Always use a base coat as it improves the adhesion between the nail and the polish. Also, a top coat is vital as it makes the manicure last longer and it fixes additional details if there are any. Play with contrasts as monochrome designs allow it. You may create free handed lines, add flat and volumetric shapes to create a textured effect. If you want to be in the spotlight, spice up the manicure with interesting details. They may be golden zircons, colorful rhinestones, glitter, and stamps. If you are a fan of DIY manicure, prepare several paint brushes and gel pens, which have a different thickness. With them, you can create both a surreal and traditional design. 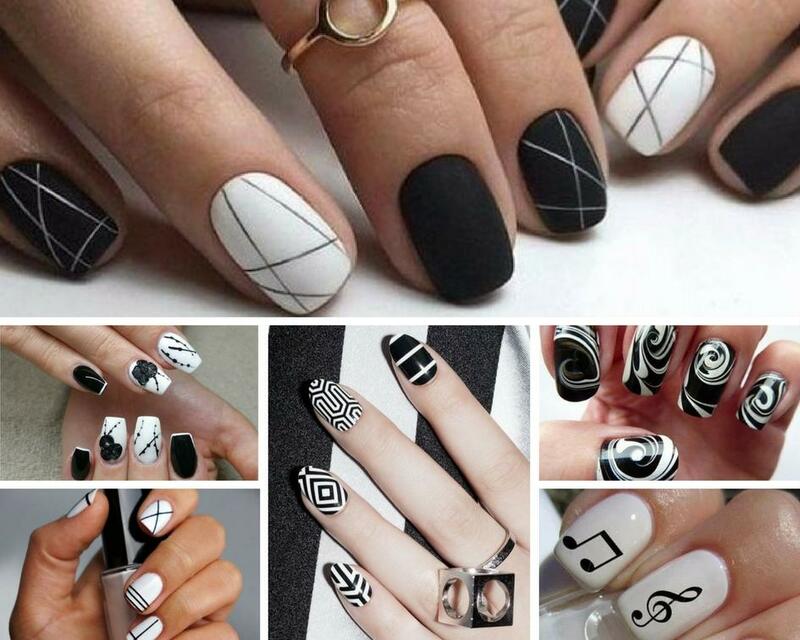 Get inspired by these awesome and creative ideas of black and white nail designs and choose the best one for yourself!